4th year Pic 158 - June - 13 2012 Elephant ride. 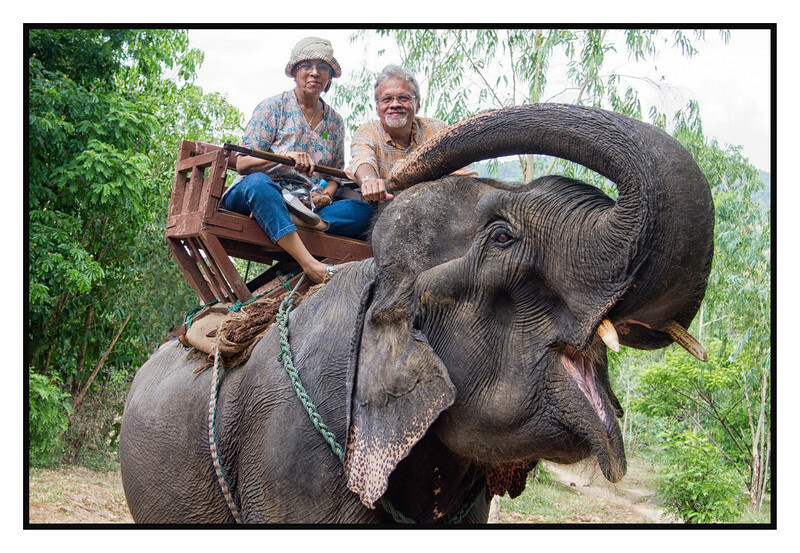 - Maetaeng Elephant Park, Cihang Mai, Thailand This one is for Art, he commented on my earlier pic that he would like to go for such a ride! Chiang Mai has several Elephant parks. Maetaeng park offers elephant rides, elephant shows, bullock cart rides and a ride down the rive on a bamboo raft! Awesome! This looks like a very fun adventure. That's great! I love elephants and would love to have an elephant ride some day. I'm way behind in commenting - but I have to tell you that this is a fabulous photo. I love the joy on your face as your grasp the elephant's trunk. Awesome and fun shot - so nice to see you Harsh. I too would love to ride and elephant (and a zebra for that matter) but it's not likely to happen in my lifetime - so I'm "digging" your photos and living the experience through them. This is fantastic!